Very interesting with regard the whole practice of privateering and how it differed (or didn't) from piracy. This book got a little bogged down in numbers and statistics at times but was worth the effort. Every time I drink Captain Morgan now I will probably bother my drinking buddies with some trivia from this book. After reading Talty's book on Captain Henry Morgan (Empire of Blue Water), I went on to read this book by Peter Earle who Talty mentions several times in his work. Earle is quite good at engaging a reader in his narrative and kept me reading on about the taking of Panama by an entire army of pirates in the late 1600s. 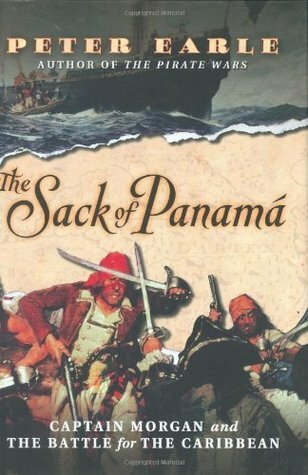 This covers Captain Morgan's sack of Panama where he roasted women alive, put bands around heads of people he asked about where the loot was and squeezed so hard their eyes popped out among other atrocities but was a hero to the British since it was Spanish people he did it to. Recalling the swarthy lads who pilfered the richest ports of the Spanish main. An enthralling read when in the midst of a raid, boring as bureaucracy when detailing the politics behind the mess in the West Indies. This is narrative history at its best. Earle skillfully weaves his primary-source research into a fast-paced and well-organized narrative. Truly a fine book. Can't go through a page without struggling with my head that I don't want to sleep!